Editor’s note: This article originally appeared in School Planning & Management, November 2007, published by The Peter Li Education Group; reprinted here with permission. Engaging students in their educational environment is one of the major challenges today’s school administrators face. Recent studies show a direct correlation between students’ physical surroundings and their scholastic performance levels. A creatively designed environment encourages pupils – be they pre-K or college freshmen – to be more creative themselves. We have found artwork to be a compelling vehicle for expanding the territory of educational opportunity, and use it to engage, inspire and delight. Integrating sculpture and figurative art with architecture in the design vernacular of the 21st century can give poetic voice to a school’s or college’s mission, and provide evidence of the human touch largely absent in contemporary architecture. The relationship between architecture and art offers a dimension of expression that complements the functional response to individual and collective needs by involving students in the architecture at a more intimate and experiential level. In New Haven, Connecticut, city officials are encouraging the incorporation of original artwork into rebuilt and renovated elementary schools. They understand this dimension is an essential part of a child’s educational environment, and can enliven the educational process in unexpected ways. Embracing this approach, two of the city’s newest preK-8 schools – Beecher School and Columbus Family Academy – are founded in themed figurative art designed to convey each school’s inner spirit. With both of these projects, Svigals + Partners introduced the idea of artwork at the earliest stages of design that allowed its seamless integration into the development of the architecture. The new 77,000-square-foot Beecher School, completed in June 2007, showcases two major figurative works. A 30-inch-high aluminum frieze comprises more than 300 dancing figures representing students and faculty, and functions as a crown wrapping the school’s entire 500-foot perimeter. Its hand-finished surface – positioned to reflect sunlight differently throughout the day as well as the jagged red cliffs of nearby West Rock Ridge State Park – creates a variety of lighting effects, contributing to the illusion of movement among the dancers. Enjoyed by the students and teachers, it also offers a vibrant play of light to all those who drive by. 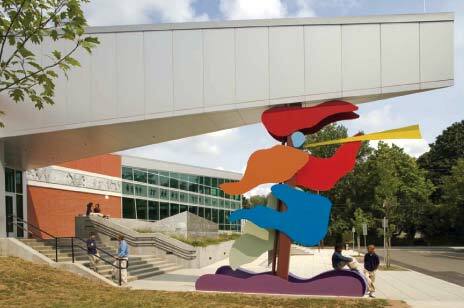 The second piece, a multi-color steel caryatid formed from collage-like shapes, measures 18 feet in height and supports the school’s soaring entrance canopy. The sculpture is an abstract articulation of two metaphorical figures: a “Gideon” calling the students to the school, and a “Pied Piper” who, if the promise of education is not delivered, calls the students away. The dual image represents the opportunity to educate children, as well as the responsibility to do so. The “collage” design also gives to the students a window into how it was made, transforming a column to a figure, and suggesting that they, too, could be similarly creative. 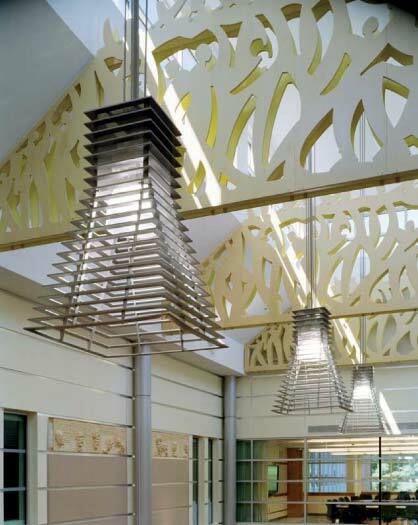 In addition to its sculptural art, Beecher School features custom-designed handrails and a gigantic kinetic mobile fabricated by noted British artist, Tim Prentice. Suspended from the school’s 45-foot-high atrium and characterized by hundreds of fluttering, reflective panes, the mobile forms “clouds” which are animated by the building’s ventilation system and shower the atrium floor and walls with sparkling light. With Columbus Family Academy, slated for completion in summer 2008, the design team focused on a theme of discovery, using interior and exterior spaces to help students relate to their surroundings and the world at large. Five hundred square feet of sculpture – in the form of 11 13x6-foot fiberglass reliefs on the classroom façades – serve as allegorical symbols of Christopher Columbus’s voyage to the New World. Representations of his three ships and the variety of winds responsible for his epic journey are expressed within a tapestry of multi-colored brick panels. These reach from floor to floor and classroom to classroom – as a touchstone for each of the building’s major facades – to signify its collaborative vision across grades and languages (English and Spanish), and the diversity of the student population in terms of age, race, and religion. Images are offered at atypical perspectives, suggesting a new way to look at the world. The sculpture also provides teachers an opportunity to invite students to conceptualize both history and their relationship to the natural world. Setting the stage for the school’s discovery theme is a sculpture of Rodrigo de Triana, reputed to be the first among Columbus’s crew to sight land. Crafted by celebrated Puerto Rican sculptor José Buscaglia, it “sails” over the school’s entrance on a column symbolizing the Pinta’s mast and crow’s nest – welcoming members of the school, and residential and business communities to the 80,000-square-foot facility. A further embodiment of the joining of art and pedagogy is evident in Connecticut’s Norwalk Community College, specifically its two-story Center for Information Technology, completed in September 2003. 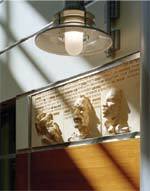 Incorporated into the walls of the center’s 34,500-square-foot atrium are 55 2x2-foot panels of in­dividually sculpted portraits with quotes in bas relief behind the men responsible for them. In the work, entitled “5000 Years of Information Technology,” 10 prominent contributors to the field of communications – from Demosthenes to Alan Turing – interact through time via metaphorical “conversations,” thereby linking history with the thinkers, dreamers, and doers whose work in some way contributed to the development and evolution of the computer. The panels repeat throughout the atrium, where the figures “converse” with a variety of partners in a total of 58 permutations. The intent of this piece is to connect students to the historical evolution of information communication dating back thousands of years, and integrate this story seamlessly with the architecture. The atrium is also distinguished by four large structural trusses spanning the space. The trusses are enlivened figurative tracery, alluding to the classical pediment, yet interpreted in a contemporary manner. In this way, the center is connected to its traditional educational roots while transcending them with an innovative spirit. Remembering that beauty and function are inseparable, figurative artwork is a natural element in the architecture of all three educational facilities, nourishing the student body in ways that complement other aspects of the educational experience. Whether in new construction or renovation, a symbiotic relationship between architecture and art can yield a school that teaches on multiple levels, touching the minds and spirits of students of all ages. Barry Svigals, FAIA, is managing partner of Svigals + Partners and the artist responsible for all of his firm’s ornamental and sculptural work. Established in 1983, Svigals + Partners is a full-service architectural design and master planning firm based in New Haven, CT. Its staff of 27 specializes in education, laboratory, corporate, and master planning for clients throughout the U.S. Contractor: C&R Development Co. Inc. 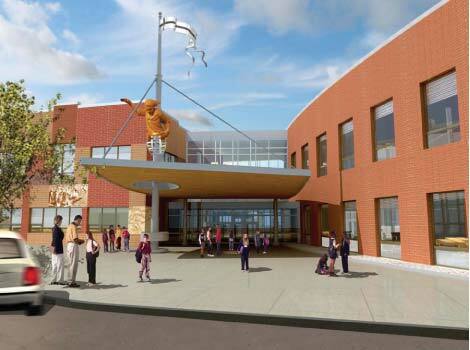 Contractor: A. Prete Construction Co. Inc.
Beecher School: An 18-foot-tall “dancing” caraytid, designed by architect and sculptor Barry Svigals, supports the school’s new entrance canopy. The abstract steel figure represents two mythical characters: a Gideon calling the students to school and a Pied Piper, who, if the promise of education is not received, will call the students away. Beecher School: The $23.7 million renovation melds the school’s original 1913 two-story structure with a multi-purpose addition designed to create a variety of stimulating learning environments. 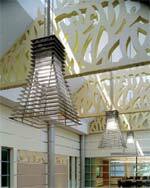 A dramatic atrium links the old and new, and establishes the facility’s primary entrance. 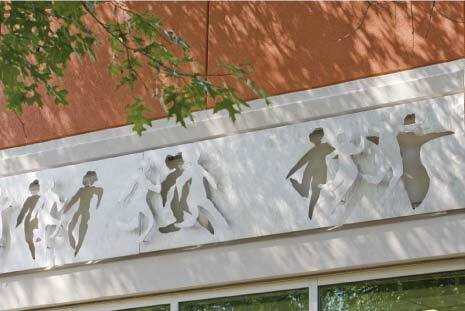 Beecher School: The brushed aluminum frieze, also designed by Svigals, wraps the entire perimeter of the school, and features more than 300 dancing figures representing students and faculty. 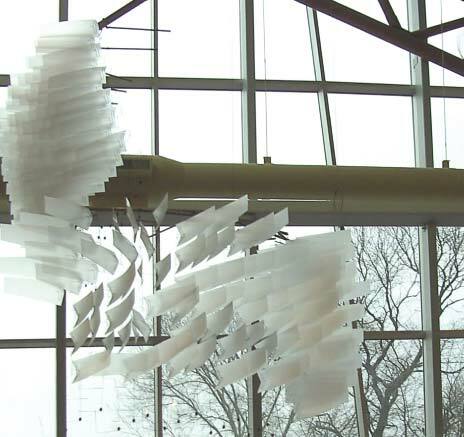 Beecher School: A gigantic kinetic mobile by Tim Prentice is suspended from the ceiling of the school’s atrium; hundreds of fluttering reflective panes are animated by the building’s ventilation system, showering the atrium floor and walls with sparkling daylight. 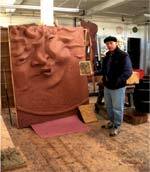 Columbus Family Academy: Svigals holds clay model next to “South Wind,” which will be incorporated into one of 11 huge sculptural panels on the façade of the new elementary school. Center for Information Technology: Steel trusses spanning the atrium, necessary for the structural support of the roof and clerestory monitor, were camouflaged with a tracery design that recalls the traditional classical pediment but uses figures-in-motion to express the enlivened energy of the new center. Center for Information Technology: The atrium features a series of 10 two-foot by two-foot sculptural panels, each bearing the likeness of a prominent contributor to the field of communications presented against the backdrop of his own words; the 10 panels repeat throughout the atrium, providing the figures an opportunity to “converse” with a variety of partners in a total of 58 permutations.